1) No flash. Period. You don’t need it, and it achieves the dual purpose of disrupting the performing artist and irritating the hell out of the paying public. 2) Be invisible. Keep to the shadows, venturing out for a few seconds only to get that critical shot. If you are lucky enough to shoot from backstage, stay out of view, and certainly don’t lurk behind the stacks or PA systems where everyone can see you. You should be nowhere near the artists. 3) No tripods or monopods. You’ll just be poking an audience member (who paid to be there) with it, and again, it’s wholly unnecessary. 4) Bring the proper equipment. You need fast and sharp lenses. If you don’t own them, rent them. Otherwise you are wasting your time bringing your 18-55mm Sigma, just stay home. You need the 70-200mm VR II f2.8 Nikon or something similar. 5) If there are many photographers present, then the promoter should have you organized. You should know in advance how long you have and who you can shoot. If there are other photographers, communicate with them and help each other out, making sure that there isn’t a gang of you distracting the paying public. 6) If you are a beginner and need advice, by all means ask questions before or after the gig, but keep in mind that during the gig the guy you are asking questions to is WORKING. While the performance is occurring it would be better for you to keep your eyes and ears open, and your mouth shut. Trying to make it seem that you know what you are all about by making sweeping statements like “I never shoot RAW” or “I don’t shoot above 400 ISO” will assure that you never, ever, will be working in this field. 7) Turn your LCD screen off. It’s distracting for the paying customers. Did I mention that they paid to be there? 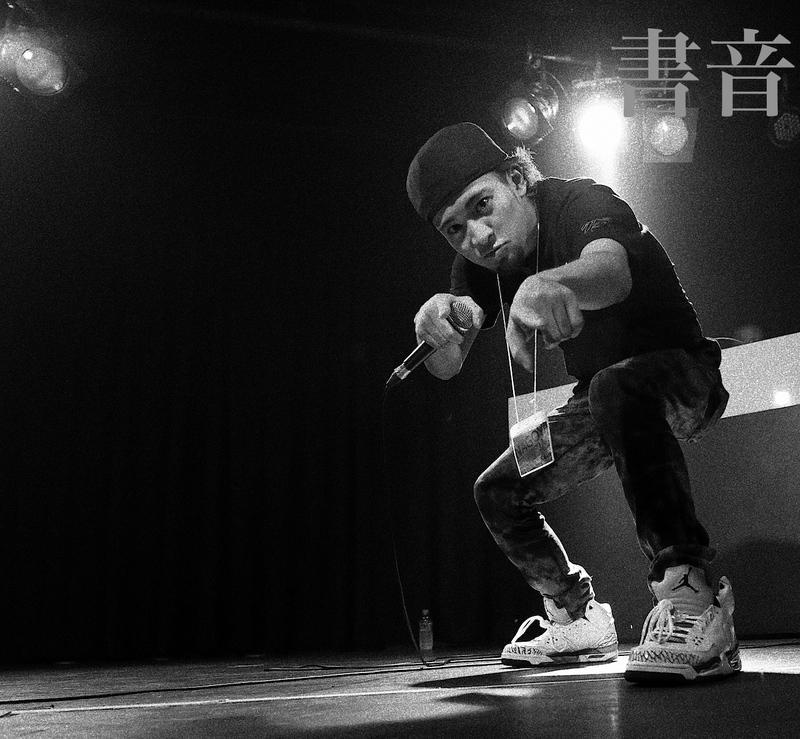 Let’s look at an example , the picture below which was taken at Summer Jam 2013 (X-Hall in Nagoya, Japan). It’s taken from RAW with no processing to make the point. There are THREE GUYS ON STAGE! What the hell are they doing there? And then you have the clown with his LCD screen on, taking pictures from the audience. I observed him walking in front of paying customers, blocking their field of view for minutes at a time, snapping away. The two guys on stage are instantly revealed as beginners with no clue as to what they are doing: both are using flash and have non-Nikon/Canon lenses (I saw a Sigma and a Tokina) which were neither fast enough or had enough zoom to get in close tight shots. They are also taking photos with flash and are too close (minimum focus distance) to get sharp photos. And the moron with the video camera, who actually had a focussing light on all the time. Yes kids, it was amateur hour in Nagoya. I can only pray that none of them were charging clients money. Or maybe I should, since it will make the photos that I took look that much better, and I can charge double or triple whatever they are billing. Please leave the photo taking to the pros. If you absolutely must try, start with your friend in that cover band he does now and then before you tackle bigger events. Learn from the pros, and stay hidden. Remember, the public paid to be there even if you didn’t. Their enjoyment comes before yours. End of discussion. I agree with everything you say. Where I live unless you are accredited you not allowed to use “professional cameras” or cameras with detachable lenses, meaning I cannot take photos and also that shining lcds are everywhere and flash goes off all the time they are just not “professional cameras”. I just realized there is actually another photographer in the crowd who has his LCD screen on his flash on. This is turning into spot the photographer monkey. Thanks for your comments. Photoessay – Sunsets Pt I.